You’re the last line of defense. You stand in front of “the cage,” and prepare for the opponent’s assault. You holler instructions to your teammates—“Watch out for the sniper up top!” and “Protect the crease!”—when an invader encroaches on your base. The projectile reaches speeds upward of 100 mph—faster than the blink of an eye. You’re hit… you don’t stop. You pick up the slug off of the turf then launch it into the open field to start the counter attack. Not quite, although some might consider playing lacrosse goalie as harrowing as entering the line of fire. But for the select fraternity who are tasked with protecting the six-by-six-foot goal in Major League Lacrosse, it’s their profession and their passion. “Most people think we’re insane,” says Drew Adams, the Long Island Lizards’ goalie who was named the Goalie of the Year earlier this week. On Saturday, Galloway and Adams will meet in the MLL Championship, as the Rattlers and Lizards face off at Fifth Third Bank Stadium in Kennesaw, Ga. So how did the members of this select group choose their position? For many, it was a case of heredity more than preference. Starting when Turner was around five years old, his brothers made him the default goalie for their backyard battles. He’s not alone. Galloway and Jesse Schwartzman, goalie for the Denver Outlaws, shared similar stories of sibling coercion. And while most of the goalies interviewed say that hockey and lacrosse require many of the same skills, such as quick reflexes and hand-eye coordination, they all contend there is one obvious difference. 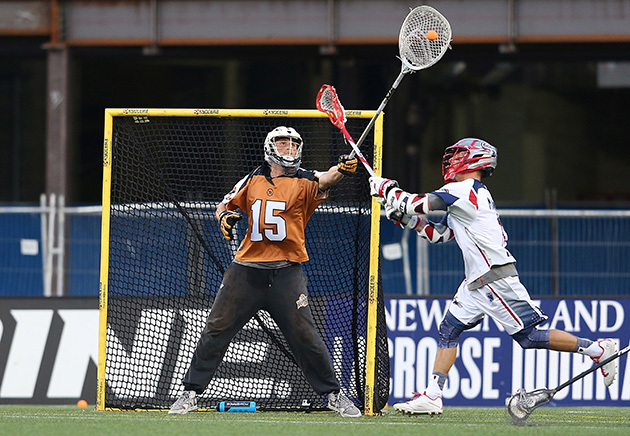 In contrast to their on-ice brethren, lacrosse goalies wear no protection on their arms and legs. The main pieces of padding are a chest protector, a throat guard and gloves with reinforced thumbs. But some think even that is excessive. Until last season, Galloway wore a chest protector that was roughly the size of a lobster bib. It was designed for grade-schoolers. “You want to be able to move as much as possible,” Galloway says, attempting to justify his decision. The occupational hazards of playing goalie have caused some awkward moments for those who step between the pipes. Shortly after beginning his career as a stopper in middle school, Schwartzman had a memorable visit to the doctor’s office for a check up. Towards the end of the appointment, there was a long silence. The doctor then asked Debbie, Schwartzman’s mother, to step outside the room. “Is everything all right at home?” he asked Jesse once Debbie was out of earshot. “My legs were so covered in bruises they thought something was wrong,” Schwartzman says with a laugh. The mental challenges of the position may be even more daunting than the physical toll. Every time a goalie concedes a shot, his error flashes in bright lights on the scoreboard. And in lacrosse, players “light the lamp” far more often than in hockey. Just look at the numbers. The Boston Bruins’ Tuukka Raask and his 92.6 career save percentage leads all NHL netminders who have played at least 250 games. 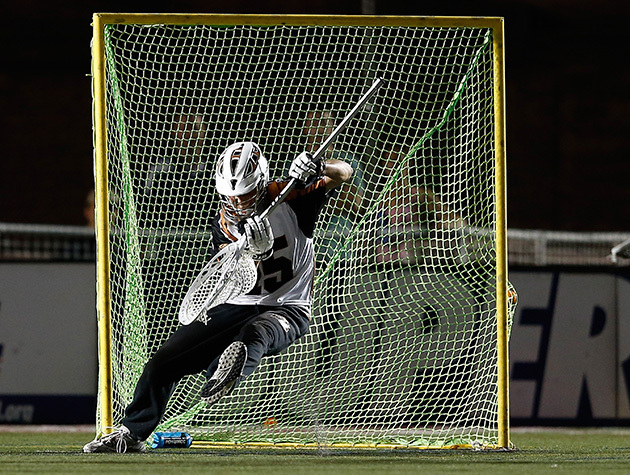 Schwartzman holds the record for career save percentage in the MLL. His success rate? offenses average close to 35 shots on goal each game. The Long Island Lizards led the league this season with 14.7 goals per game. But all of the goalies interviewed still like their chances of making a crucial stop. To get in the right mind-frame, most goalies resort to a unique array of pregame superstitions. Turner reads a chapter from the book Mind Gym by William Mack to help him visualize success. Galloway wears sweat pants regardless of the temperature and re-tapes his stick the exact same way. (The forecast for Saturday’s Championship, according to weather.com, is 89 degrees with 77% humidity). Adams, though, says that he doesn’t incorporate any rituals. “After most people get to know me, they usually tell me, ‘You’re the most normal goalie I’ve ever met,’ ” he says.